My wife and I are in Florida for a few days, visiting Sanibel Island and maybe the Everglades. No Pic of the Day for yesterday because we left home at 4 AM to catch our flight. 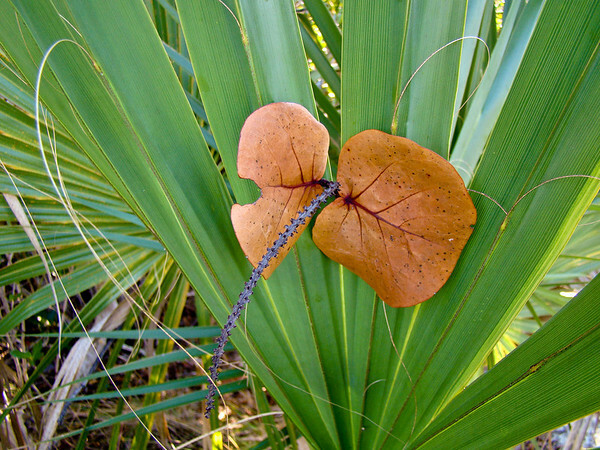 We got to Ft. Myers with time enough to walk the Indigo Trail at Ding Darling National Wildlife Refuge. There were not, to the honest, many birds in the late afternoon, but this intersection of two plants, in very different life-stages, caught my eye, as design. As simple a shot as they come. Simply frame and shoot. Sony DSC H50 at full wide angle, macro mode. F2.7 @ 1/40th @ ISO 125. Programed Auto. Small amount of sharpening and Vibrance in Lightroom. I used the Auto setting under Color and White Balance to warm the image (taken in the shade) slightly. From the new Sanibel and Everglades Gallery.